Amazing Grays wins a 2009 Reviewers Choice Award! Amazing Grays is truly the best book on aging gracefully that I have ever read! Period. Exclamation point! Once I got started, I couldn't put it down. Maggie has given me a whole new perspective on aging by showing me how to not succumb to the fear based chatter in my head. She has validated what I suspected - that the possibilities of the next 50 far outweigh the fears. This is most definitely NOT a book just about gray hair - it's so much more. I can't say enough about how grateful I am as a baby boomer (1959) that Maggie wrote this wonderful book! I grabbed my yellow marker and have marked up the book with quote after quote after quote of Maggie's wisdom (not the sidebar items, although they were great too). I'm reading them over and over so that her words of wisdom stick with me - for good! Give yourself a gift - buy this book! At first I was skeptical of "just another book on aging", but Maggie Crane's Amazing Grays has opened my life to just that...amazing grace. A lifetime of never measuring up to the approved cultural Barbie Doll model left me, at 61, feeling like a hasbeen that never was! Drawing on her incredible insight and humor, Maggie speaks to self-realization in a way that finally connects; that finally makes it not only "OK" but actually, a relief to be at home in my own skin...no longer afraid to exhale. Thanks, Maggie. About so much more than hair color! This book went immediately on my list of resources for midlife women in my coaching business. 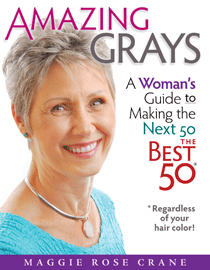 While hair coloring and emerging as a "silver sage" provide a unique "hook" for this book, the breadth of Crane's topics contains ALL the critical components for empowering women at midlife and beyond. In addition to the wealth of relevant quotes, the author's generous sharing of herself lends authenticity and inspires the reader. Other than the fact that I haven't turned gray yet, it's a book I wish I had written. If you want your hair to go gray, this book will show you how. If you have no intention of ever having gray hair  Amazing Grays is for you too! As opposed to books written by celebrities, which I have found difficult to relate to, Maggie's book feels like it was written with me and my personal situation in mind. I've learned that physical changes are part of the process, that I'm probably not getting Alzheimer's, and that my desire to cocoon is perfectly normal at this stage of life! I've also learned all about bio-identical hormones. I've begun a mindfulness practice and am exploring "roots of a deeper kind" (her words, not mine). I especially love the questions throughout the book that support me in peeling away the past and giving a voice to the future. This book is easy to read, yet profound in the insight it offers. I highly recommend it to all maturing women - regardless of your hair color! Don't wait to hit 50 to read this treasure of a book! Though I'm still in my mid-40s… I've certainly begun experiencing aspects of beginning to age. Having lost my mother while in my twenties, being the oldest in my family and the oldest in my circle of girlfriends, I was looking for some guidance as mid-life approaches. Maggie Crane writes with such honesty and insight! I was so moved by the generosity with which she shares her own experiences. About hair color and so much more! She provides practical information with clarity and without the feel of reading a textbook. I found answers to questions I didn't even know to ask. This book is uplifting and empowering. I'll be buying copies for my sisters and girlfriends - way before they turn 50! Amazing Grays provides the reader with an intimate look into the ups and downs of aging from a real women's perspective. Maggie Crane candidly shares her journey through midlife and offers women a lifeline through this sometimes-confusing transition. I especially loved the questions she poses throughout the book, encouraging each of us to look deeper into what’s keeping us from living our lives full out. The before-and-after pictures of Maggie on the back cover say it all. The woman I see in the “after" photo is clearly a woman who has faced her gremlins, dug deep, embraced her authenticity - and is loving life! Don't we all want that? As an executive coach, I recommend this book to my midlife clients without hesitation. I purchased this book for both my mom and mother-in-law and have received wonderful feedback from each of them. Amazing Grays does a great job of helping women transition into the next stage of life with grace and ease despite our country's culture for focusing on youth. Although I am not gray yet, I plan to keep a copy of this book in my library for when the time comes. Truly a fantastic read - thank you to Maggie Crane for tackling such a needed subject. When I read Maggie's book, it was as though she had read my mind, brought up all the concerns and dilemmas I was facing. I immediately felt like I had company on this confusing journey. There were real answers here…well researched explanations of my options, expressed so clearly from a real grown woman’s perspective that it was as though I had taken the years to study them myself…only better. Amazing Grays will help you sort through fact and fiction to come up with a real life approach so that as you live longer you’ll feel better doing it! This book is a road map for finding your own peace, adjusting your attitude and taking the journey like a class act. We can rail against pesky gravity, passing time and life’s disappointments, but in the end it’s all about accepting change, creating balance and finding value. As I read Amazing Grays I couldn't help feeling like I was having coffee with a good friend. I kept thinking; how does she know that's how I feel! I was energized and excited as I took in Maggie's practical advice to stop worrying about our imperfect bodies and look to future possibilities. As I will be entering my fifties in a few years, I appreciate the help with attitude shifts and refocusing my thoughts and feelings. I would recommend this book to anyone who wants to look to the future with "gusto" and excitement. Amazing Grays is right on! I am amazed at the truths found in this book. Too many women put stock in the temporal instead of the eternal perspective - including their beliefs about themselves. I am inspired to "go gray" by all of her findings about how unhealthy it is to color your hair, as well as how emotionally unhealthy it is to stay locked into the past! I have great admiration for the author. Her courage and inner beauty shines through! I pray this book is a great success! As I continue to surrender outdated parts of myself on my own journey through aging, I am reminded by this book that this season in life can truly give us back to ourselves. Maggie Crane has opened up her heart and allowed us to share in her journey with breathtaking honesty. Choosing to embrace the fresh perspectives in her book will allow you to be more courageous in the face of change, and embrace the authentic you. With her elegantly straightforward style of writing, Maggie helps take us to a place of real joy…a step beyond happiness.